The Weavers lost everything, but that didn't compare to leaving behind Izzy. When one of Northern California's wildfires began tearing through a Santa Rosa neighborhood Kathy Weaver saw the flames engulfing their house and had to flee with the nothing but a nightgown. 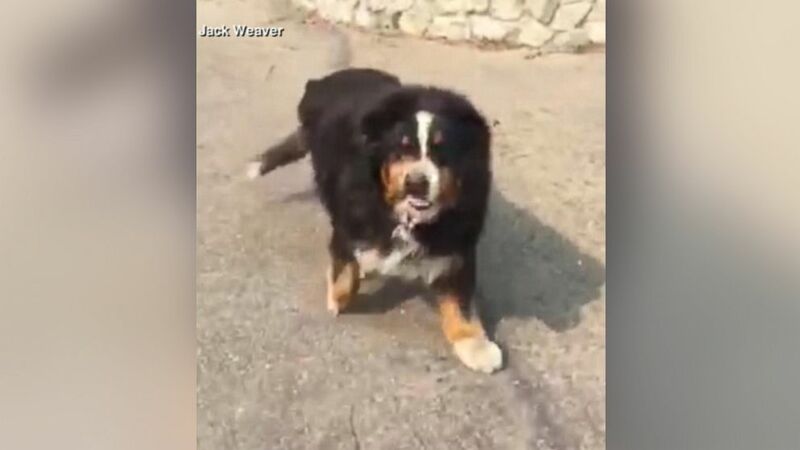 She left behind everything, including her beloved 9-year-old Bernese Mountain dog Izzy. "In the chaos of trying to escape, my parents' dog Izzy ran from them," Beckyjean Widen, Kathy's daughter, posted on Facebook. "My mom couldn't chase after her without risking her own life." She added that her mother drove to safety through "walls of flames and across a burning wooden bridge" to stay alive. The loss to her family's home was nothing compared to leaving behind their other family member. "They lost everything, but my mom was most devastated about leaving Izzy," Widen added on the Facebook post. 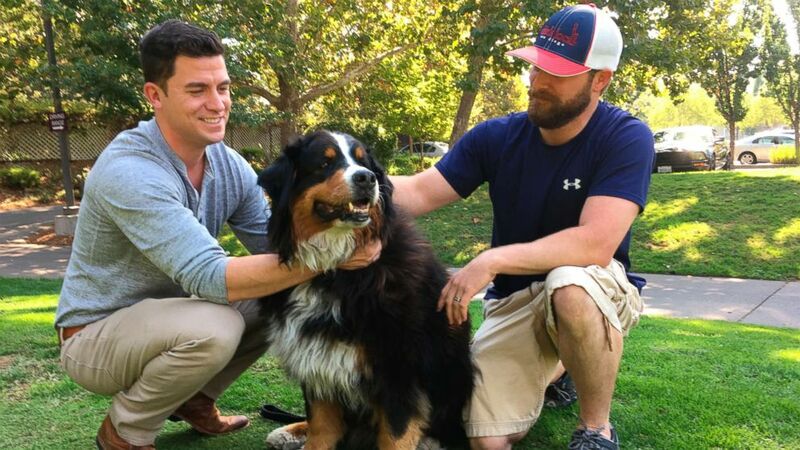 (Jonathan Copper/AP) Jack Weaver, left, and his brother in law, Patrick Widen, pose with Izzy, a 9-year-old Bernese Mountain Dog, who belongs to Weaver's parents, Oct. 14, 2017, in Windsor, Calif. So when her brother Jack Weaver and Widen's husband Patrick returned to the ruins expecting to recover Izzy's remains -- they disregarded police orders to steer clear and breached the barricade to take a three-mile hike, according to the Facebook post. "There's so much smoke I can't show you the view," Weaver is heard saying in a video on the post. Their effort reaped an incredible discovery. (Jack Weaver) Izzy, a 9-year-old Bernese Mountain Dog emerges alive and cheerful from a wildfire. Weaver recorded his walk along the paved driveway and showed how rows of vineyards appeared to remain perfectly green and unscathed, while a tractor was also spared. Then as Weaver's breathing intensified, he and his brother's whistling and clapping became exaltation. Out of the shrubs and cemented rock steps 30 feet away came a healthy and happy Izzy. "Izzy here! Izzy," he said in the Facebook video. "Hey baby!" "We didn’t expect to see her," Weaver said in an interview that aired on "Good Morning America" Sunday. The find left Weaver grateful. "[We were] praying she would be there," he said.